Pilani: Noted women’s rights activists and founder of the Honour for Women National Campaign Manasi Pradhan inaugurated the 2017 Joy of Giving Week organized by the BITS Pilani on Monday. The inaugural function held at the BITS Pilani auditorium was attended by professors and students of the prestigious Birla Institute of Technology and Science situated in the town of Pilani in Rajasthan. The Joy of Giving Week is organized every year by the BITS Pilani student society ‘Nirmaan’. 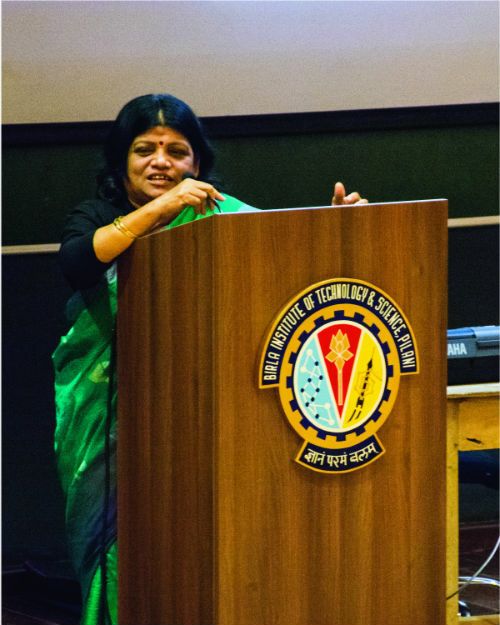 Inaugurating the week-long celebration in the campus, Manasi Pradhan lauded the effort of the BITS Pilani students and faculties in organizing the Joy Giving in Week with such enthusiasm and fervour. “It is heartening to see the students of a premier seat of learning like BITS Pilani, who will be heading global entities as technocrats, scientists and administrators, imbibing such spirit of social commitment in them” Pradhan said. Explaining how the joy of giving others is enormous, she extolled those present to inculcate the habit of sharing and giving others particularly the deprived and the helpless in their daily life and observe the positive change it brings to their own life. The Joy of Giving Week in the prestigious BITS Pilani campus over next six days will include several events, activities and social awareness campaigns. The Joy of Giving Week is a “festival of giving” that aims to bring together Indians all across the country and abroad through different acts of giving- money, time, skills or resources. The goal is to convert it into a fully public-owned festival, just like Diwali, Holi or Thanksgiving, none of which are owned by anyone. The Week was launched in 2009 and is held every year across India.